The number of criminal and gang-related assaults involving acid or other corrosive substances has risen sharply in some Western countries. As of July 2017, police statistics in England indicate assaults and threats involving corrosives have risen from 183 in 2012 to more than 500 this year, according to open source reporting. Although there has been minimal specific interest by terrorists in acid attacks to date, we judge the increase in criminal incidents coupled with recent English-language terrorist messaging encouraging attacks using acid may spur opportunistic terrorist use of the tactic, underscoring the potential threat and importance of an immediate on-scene emergency response. • When safely able, immediately remove victim(s) from ongoing exposure. • Remove any clothing and jewelry, while ensuring the substance does not continue to come into contact with skin. • Immediately remove substance from affected area; if liquid, flush with copious amounts of water for no less than 20 minutes, ensuring no contaminated puddles are collected under the victim(s). If the chemical is dry, carefully brush it off the victim’s skin in a manner which avoids additional contamination. • Do not touch or try to remove any adhered debris in an affected area. • Do not apply any kind of cream or ointment. Attempting to neutralize a corrosive material risks a chemical reaction which may result in thermal burns. • If possible, find out what corrosive was used which may assist emergency medical personnel and healthcare professionals in determining appropriate treatment. 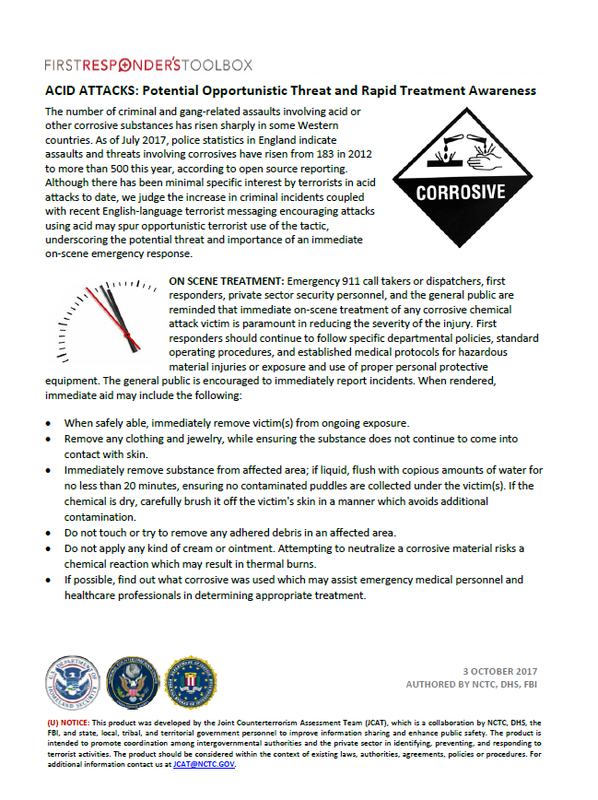 • If the corrosive is identified, the Emergency Response Guide, a.k.a. “the Orange Book” will offer first aid treatment and health considerations under the “guide” section. Example—Battery Fluid, Acid, ID #2796 Guide #157. ADDITIONAL CONSIDERATIONS: Since acid is legal to obtain and is readily available, it is challenging to detect suspicious activity related to its acquisition and use in a terrorist attack. • Acid is relatively easy to handle; however, it is still a hazardous corrosive. Its transportation and storage may result in specific, recognizable injuries requiring medical treatment if there is a spill or it is stored in a wrong type of container, thereby causing a leak. • Acid is also a precursor for the homemade explosives (HME) Triacetone Triperoxide (TATP) and Hexamethylene Triperoxide Diamine (HMTD). HMEs and precursor chemicals may be inherently dangerous and should be treated accordingly until rendered safe by subject matter experts.